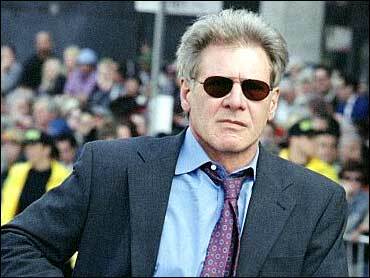 With roles such as Han Solo, Indiana Jones, Jack Ryan and the president of the United States, it's no wonder Harrison Ford is the biggest grossing movie star of all time. In his latest film, the action comedy "Hollywood Homicide," Ford plays a veteran police detective investigating a murder with his inexperienced partner, played by Josh Hartnett (Black Hawk Down). Ford describes Hartnett's character as a, "fresh young detective, who is also a yoga teacher, who really wants to be an actor. One of the sort of bones of this thing is that these guys have part-time jobs." Ford's character, meanwhile, is a realtor trying to sell a house to rapper Master P.
Ford says it is when the characters' part-time jobs begin to overlap with their police work that the fun begins. "It's real L.A. story," says Ford. "It's good-natured fun. It's a great place. It's place where you're likely to get a script from your dentist as you are from your agent." To prepare for their roles, Ford and Hartnett visited the Los Angeles Police Academy firing range and observed the inner workings of L.A.P.D. 's Hollywood division headquarters. On set, they barraged police consultants with questions about procedure as well as more personal questions regarding the balance between pursuing criminals and maintaining a life that is separate from their work. Ford notes, "One woman introduced herself to me as the singing detective. She did studio sessions." Next for Ford is the "Indiana Jones 4" movie. He says, "I'm looking forward to that. We anticipate starting toward the end of the summer 2004. I haven't seen the script yet, but Steven (Spielberg) saw it. Not only saw it, read it, and thinks we're pretty close. I'll get it in a couple of weeks." What he is not doing is the voiceover of Bob the Builder movie, as has been reported. He says, "I saw those reports. No. Nobody's ever spoken to me about it." For now, he is on the cover of magazines and newspapers, even though he likes to be a private person. Ford says, "I have got something to sell. I'm proud of the work and happy to take advantage of this brief moment of time to try and bring to it people's attention. I'm happy with the movie. So I'm out there." And those pictures that show him with his, love Calista Flockhart? Ford says, "Well, yeah. I mean, it's really acknowledging a reality. I'm not embarrassed by it." Born July 13, 1942, in Chicago, Ill. Listed his acting credit as Harrison J. Ford until 1970, even though he has no middle name, because there was already a silent actor from the '20s named Harrison Ford. Has a home in New York City and an 800-acre ranch in Jackson Hole, Wyoming. Often flies his own single-engine plane between residences; also flies a helicopter. Chosen as People Magazine's Sexiest Man Alive in 1998. Is a very private person and rarely gives interviews. Says that "The Mosquito Coast" was his favorite film to make.